Last week the national anthem was sung in Tamil for the first time at the official celebration of Sri Lanka’s independence day. Six years ago the government’s own regional director for education in the Tamil north, Markandu Sivalingam, was assassinated by “unidentified” gunmen for disagreeing with then President Rajapaksa’s directive to ban the singing of the national anthem in Tamil at official functions. The United Nation’s High Commissioner for Human Rights, Prince Zeid, who is currently visiting Sri Lanka, should welcome the transformation this signals in Sri Lanka’s politics in just over a year since President Sirisena’s election. No doubt, the High Commissioner will also express the UN view – set out in a Human Rights Council resolution last September – that President Sirisena must set up a court to try war crimes committed during the bloody civil war that ended in 2009. The President is on record in favour of holding violators of humanitarian and human rights law to account. But he is also committed to reaching a deal that would give the Tamil community in the north and east of Sri Lanka power to manage economic, land and cultural issues. Some argue both objectives can be realized in tandem, but the political realities in post-conflict Sri Lanka suggest otherwise. Demands for accountability for war crimes and autonomy are made by Tamil leaders but still resisted by much of the Sinhala establishment—these remain deeply polarising issues. To achieve both requires sensitivity to the politics. President Sirisena leads the Sri Lanka Freedom Party; within it, there is a strong Sinhala nationalist faction, led by former President Mahinda Rajapaksa who ruled in an authoritarian manner until he lost elections in 2015. He is not yet a spent force, however, and is adept at using the divisions over accountability and autonomy as a political platform to regain political relevance and reverse Sirisena’s moves to strengthen democracy and social co-existence. 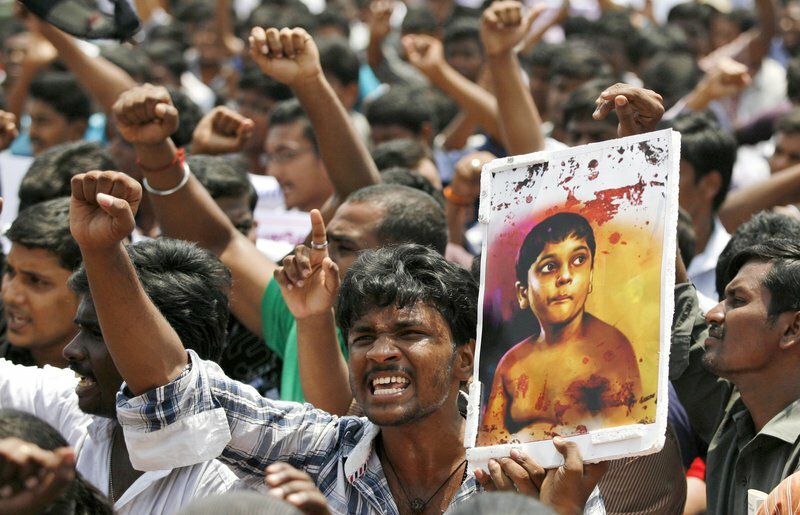 Tamil protesters demand a UN inquiry into war crimes in Sri Lanka. International human rights activists argue that credible war crimes prosecutions of both the Tamil Tigers and members of the armed forces will politically discredit both Sinhala and Tamil extremists. They also argue that individual criminal prosecutions will help to undermine narratives of collective guilt—dispensing the notion that a whole community is responsible. The trial process will bring out stories of suffering, enabling Sinhalese to know what their Tamil brethren have gone through during the war, and Tamils to better understand the concerns of their Sinhala and Muslim ones. In short, advocates of giving precedence to setting up a war crimes court over other measures for dealing with past violations of human rights and humanitarian law, believe prosecuting war crimes will promote co-existence and toleration by ending impunity, thus making it easier to reach a deal on local autonomy. Yet, while this is undoubtedly a desirable outcome, it is by no means assured. Indeed, it is more likely that Sinhala nationalists will see prosecuting war crimes as a political concession to Tamils and a diplomatic concession to the international community. Many of them will see prosecutions as a betrayal of war heroes who defeated terrorism. At best, they may be persuaded to tolerate some prosecutions as a requirement for re-entering the international community as a respectable state. Still, they will resent it. And the Sinhala nationalist faction will use this resentment in parliament to block Tamil autonomy. Giving priority to war crimes prosecutions provokes such a backlash that it undermines not just an autonomy deal, but the accountability project itself.International human rights activists who have little patience for the complex domestic politics of a country may believe this is a price worth paying—at least for the short term—to end impunity. However, they should be wary of a worse scenario: that giving priority to war crimes prosecutions provokes such a backlash that it undermines not just an autonomy deal, but the accountability project itself. Pursuing legal accountability for war crimes is not just an apolitical ‘legal’ problem that only requires juridical solutions. If courts are set up quickly with inadequate political work domestically to explain the rationale and, more importantly, to politically marginalise the extremists, they won’t succeed in winning legitimacy. It will be all too easy for the Sinhala nationalists to portray the courts as submitting to external and Tamil pressure. If the government is unable to manage the conversation nationally about why accountability is needed, it may well retreat. The cross-party and multi-ethnic coalition of moderates, liberals and progressives that the President leads will fall apart, and so too the reform effort. Rather, a war crimes court should not, at the present time, be the top priority, as it appears to be for the international community. There are other tools that also promote justice and reconciliation, including a truth commission, reparations for victims, and identifying those (presumed dead) still missing from the conflict. The government has committed itself to take action in these areas too. Let it do so—and in so doing build the case for trials on the basis of a broadly shared narrative of the atrocities perpetrated by both sides to the conflict. Above all, the international community should be supporting President Sirisena to give precedence to negotiating a deal on autonomy as part of his efforts at deepening democracy. For Sri Lankans, particularly Tamils and Muslims, real political autonomy that gives them a future stake in the running of the country as equal citizens can be just as important, maybe more so, than lengthy war crimes trials. President Sirisena has made remarkable achievements in bringing the country together in only one year. He has demonstrated his commitment to democracy by reducing his presidential powers, seeking to include the Tamil and Muslim communities in governance and forging Sri Lanka’s first national unity government. International human rights activists should curb their enthusiasm to address accountability by giving priority to establishing a war crimes court. Instead they should push first for truth commissions, reparations and identifying the missing. A war crimes court can follow. In the meantime, President Sirisena’s political reforms—if successful—will pave the path for both legal and political accountability in the long-term, by first healing the country and reconciling all communities.